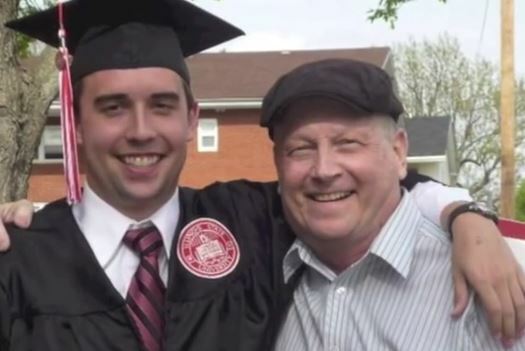 It wasn’t that long ago that Scott Gleeson ’11 watched the NCAA college basketball tournament as a fan, filling out his bracket like everyone else and following all the games with his dad. Now, he’s part of March Madness himself, as a national writer and online editor for college sports at USA TODAY. He’s writing about the Cinderella stories, bubble teams, and bracket busters that make the NCAA Tournament (starting March 17) arguably the most exciting spectacle in sports. 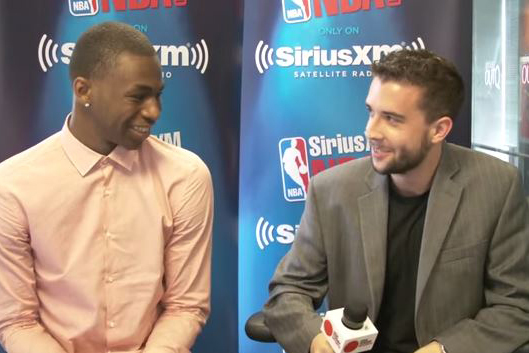 Illinois State alum Scott Gleeson interviewing top prospect Andrew Wiggins before the NBA draft. Wiggins now plays for the Minnesota Timberwolves. It’s quite an achievement for a young Illinois State University alum who just a few years ago was covering several games a week at Redbird Arena. Last year, he covered the Final Four. It’s not just luck. Gleeson is a recovering workaholic who caught the journalism bug so early that he created his own sports newsletter as a teenager (called Baller) and gave it away to family and friends. Gleeson also credits the support of “editors who believe in me,” dating back to his time at the Vidette. In fact, it was the Vidette that convinced Gleeson to attend Illinois State. After a campus tour he visited with the student newspaper’s then-general manager, Rick Jones, and was hooked. The journalism major became the Vidette’s sports editor for three years, getting exposed to all sides of the business—writing, editing, page design, relationship-building, and much more. He oversaw the Vidette’s coverage when Osiris Eldridge and Kristi Cirone were king and queen of Redbird basketball. An internship at the USA TODAY during his senior year would become his foot in the door for a full-time gig, after stops at Gannett Digital, the Washington Examiner, and SLAM Magazine. Gleeson with his dad at his ISU graduation. Gleeson is writing a sports book about fighting adversity that will star his late father, who died three years ago after a bout with cancer. Today, he’s based in Long Beach, California, and this is his busiest time of year. Comparing his job to a sports season, Gleeson says anything before February is an exhibition. February is the regular season, and March is the postseason. The NCAA Tournament is his single biggest sports event of the year. In addition to writing and uncovering storylines, Gleeson is also a web producer—creating and curating content that generates buzz on social media channels. Gleeson also pops up on camera and on the radio. “It’s difficult because you have to wear eight different hats. Being successful in this business requires having that versatility, that multi-dimensional skillset,” Gleeson said. Off the clock, Gleeson is trying to make more time for some personal passions. He’s mentoring an 8-year-old boy through Big Brothers Big Sisters, volunteering at the American Cancer Society, and writing a sports book about fighting adversity that will star his late father, who died three years ago after a bout with cancer. But between now and the NCAA championship game April 6, Gleeson will be living and breathing college hoops. He doesn’t see himself as a fan anymore, but that’s OK. Follow Gleeson on Twitter at @ScottMGleeson, or read his recent stories on USAToday.com.